So you’ve created a board or two at FlipQuiz Classic that you want here at FlipQuiz as well? You’ve come to the right place! Importing your boards is fairly easy. Copy the ID and email address to your computer’s clipboard, making it possible to paste when you need it. We’ll get to that next. 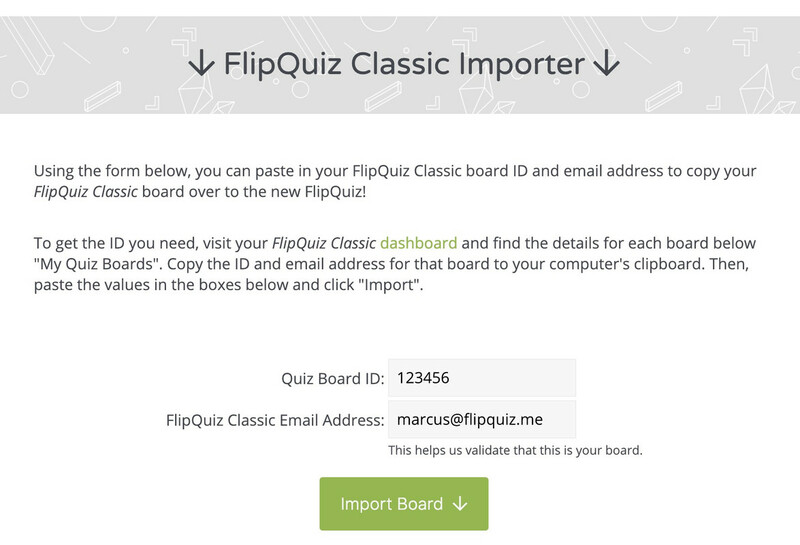 Once you’ve copied the ID and email from FlipQuiz Classic, you’ll want to paste them into the FlipQuiz Classic Importer at FlipQuiz. Go ahead and paste the contents of the clipboard into the text fields and click the “Import Board” button. After a few moments, your board will be created and you’ll be provided a link to its overview page. From there, you can modify it to your liking or go ahead and play it right away!